The only thing worse than an early morning screening on a Saturday morning is an early morning screening on a Sunday morning. Luckily The Place Beyond the Pines (dir. Derek Cianfrance) made the 8:45 alarm and subsequent hour-long commute just about bearable. Ryan Gosling, Eva Mendes and Bradley Cooper star. The film marks a step-up for the director - its go-for-broke narrative is an ambitious step-up from the solid if overpraised Blue Valentine. ... Pines presents a compelling melodrama so serious, so sprawling, so proud that it's almost quaint yet also extremely admirable. Unfortunately I must speak in generalities to avoid spoilers, which in this case may well diminish your impact of the film: despite a few developments that border on the ridiculous, and an unusual structure that will catch audiences off guard for better and worse, the film bewitches more than it infuriates. Accusations of over-seriousness are not unwarranted, but if you allow the film to wash over you there are many pleasures to be found. In more than one way it was a surprisingly apt antidote to the sprawling mess that was Cloud Atlas the previous evening. I've found myself surprisingly fond of Steven Soderbergh's recent output, warts and all. So if he follows through on this threats and makes Side Effects his last film, it will be a disappointment. His supposed curtain call is a typically smart, slick thriller that differs enough from the norm to make it consistently surprising and involving (although the Cineworld screen made the visuals look surprisingly flat for whatever reason). An overbusy, contrived and convoluted third act sees the film stumbling, but for the most part Soderbergh takes this story of pharmaceutical shenanigans in curious directions that aren't the familiar corporate conspiracy deal. Also great to see the gorgeous and talented Rooney Mara front and centre as a woman experience some dangerous side effects from her anti-depressant medicine. A decent performance from Jude Law as Mara's psychiatrist allows us to at least partially forgive his redundant turn in Soderbergh's Contagion. Rounding out Sunday was something completely different - a screening of Fritz Lang's 1928 Spies / Spione. What a joyous film - equally thrilling and funny. The plot is absurdly confusing at points during the opening half, but when it all eventually settles we're gifted with a series of elaborate, espionage-filled setpieces that have lost little of their verve 85 years later. Always great to see Fritz Rasp - the man with the most inherently sinister face in cinema history (see also: Diary of a Lost Girl) - on the big screen. The JDIFF screening offered a further incentive to experience this still terrific film - a live accompaniment by German musician Günther Buchwald. He played some damn good piano, all the more impressive as the film has an extremely extended running time at near 150 minutes. Musical highlights were the occasional instances where Buchwald juggled both piano and violin at the same time to match the images on screen. A fine conclusion to a long weekend of cinema going. But the Dublin Film Festival marches ever onwards with nary an opportunity for this wearied viewer to rest (although the Monday Morning lie-in was much appreciated). The 18th presented a double-bill of uncompromising features from South Korea. The first was Pietà, a wonderful return to feature film form for director Kim Ki-duk following his mental breakdown, self-imposed exile and naval-gazing documentary Arirang. In many ways this is familiar territory for Ki-duk - characters achieving some kind of enlightenment through acts of extreme (self)violence. 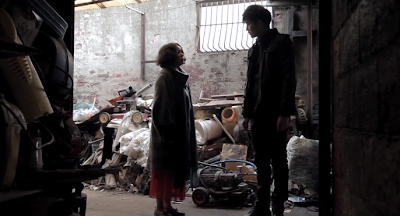 But it's beautifully realised, as a borderline psychotic debt collector (Lee Jung-jin) meets his estranged mother (Jo Min-su). The two experience an... unusual and belated bonding. Jung-jin's character is eventually forced to revisit his victims, and the film's themes of regret and the irreversible nature of our actions become ever clearer. Eventually this all morphs into an abstract sort of revenge film. Don't expect a happy ending, even when the characters' achieve their grand personal insight and emotional catharsis. Dark and violent yet surprisingly poignant - film of the festival thus far. Bleak though Pietá was, its parade of grimness was actually outdone by The King of Pigs (dir. Yeun Sang-ho). Rarely have I felt so uncomfortable for a film's entire running time - and I mean that in a good way. This low-budget Korean animation follows three school friends as they contend with their school's self-proclaimed student leaders. A harsh study of bullying, peer pressure and adolescent social dynamics - this is intense, exhausting yet undoubtedly powerful storytelling. The simple artstyle was clearly heavily influenced by limited resources, but the film's aggressively ugly character design and limited locations actually significantly enhance the pervading senses of claustrophobia and grimness. Some final twists come across as a little OTT, but that's nitpicking - King of Pigs crept under my skin and wouldn't leave even if I wanted to. As great as the film was, the brisk Dublin night air was undeniably a relief.